Shutter speed is one of the three in-camera variables when taking a photograph, the other two being aperture and ISO. You need to understand how shutter speed works and how to use shutter speed to get the kinds of photographs that you want. This post will provide an illustrated overview of shutter speed and some recommendations about which speeds to use in which situations. Shutter speed is a measurement of the length of time that your camera's shutter is open for the sensor to capture and record the light that is hitting it. The longer your shutter speed, the more light is captured and recorded. 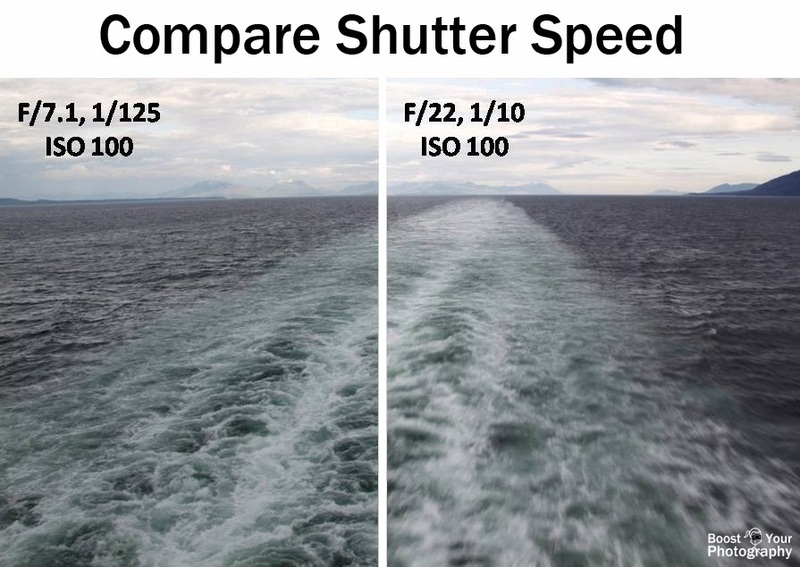 The shorter your shutter speed, the less light is captured and recorded. You can also think about it from the opposite perspective: the more light you have already in the scene, the quicker of a shutter speed you can use. The less light you have in the scene, the longer you will need to have your shutter open in order to record a balanced photograph. So, if you are shooting on a bright sunny day, you can often use shutter speeds measured in fractions of a second. If you are shooting at night without much light, you will often need to use shutter speeds measured in full seconds. If you shoot with a long shutter speed, you need to make sure that you camera stays rock-steady. The best way to do this is to use a tripod or rest your camera on a stable surface. (Read more about How to Maximize Your Tripod.) The general rule of thumb is that you can safely handhold your camera down to a shutter speed fraction of 1 over the focal length of the lens, as in 1/50th of a second for a 50 mm lens or 1/200th of a second for a 200 mm zoom lens, etc. If your shutter speed will be longer than that value, use a tripod. The following infographic is an illustrated representation of shutter speed and its application to different situations. Shutter speed is measured in a unit called stops, and each stop represents a halving or a doubling of light from the previous speed. Each interval on the chart represents one full stop of light. 1/4000th of a second is a common limit for the fastest shutter speed offered on DSLR cameras, although some top-models can shoot faster. You want to use this very quick speed if you are shooting a quickly moving subject (like a bird in flight) and want to stop its motion completely. 1/2000th and 1/1000th of a second are still very fast shutter speeds, and ones that you will mainly be able to use if you are shooting outdoors or in very bright light. The backlit heron was shot at 1/1000th of a second against the backdrop of a bright rising sun. 1/500th of a second is a great shutter speed to use when trying to freeze the motion of your subject. In general, you should be able to get a moving subject to look like it is still if you are shooting at 1/500th of a second. 1/250th is an important shutter speed to remember. This is the general limit for freezing the motion of a subject. Any slower, and you will start to see motion blur, such as with the jumping squirrel at 1/30th. 1/60th of a second will show a subject like flowing water as individual droplets (as shown) and is reaching the limit at which you can reliably handhold your camera. By 1/15th of a second, you should consider using a tripod or expect that some form of motion blur from your shaking hands may become a visible in the photograph. Practice pushing the shutter button smoothly and bracing your elbows against yourself for added stability. Around 1/4th of a second, you can create a panning effect by moving the camera at the same speed as your subject while shooting. This creates blur in the background by renders the subject frozen. Read more about Panning Photography. 1" or one second is another good shutter speed to remember. At this speed or longer, water starts becoming less individual drops and instead appears like flowing, silky strands. The three waterfalls in the graphic were shot at shutter speeds of 1/4th, 2 seconds, and 6 seconds, respectively. Read more about Shooting Waterfalls. Shutter speeds of multiple seconds allow for unique and creative nighttime photographs. The hearts and spirals were drawn with sparklers over the course of 10 seconds, while the massive amount of traffic trails by the Christmas trees took 30 seconds.See more examples and how tos in Long Exposure Photography at the Fair(e), Light Painting: how to spin an orb, and Spinning Fire with Steel Wool Photography. The final shutter speed is often labelled as "B" for Bulb. In bulb mode, the camera's shutter will stay open as long as it is held down (or, more commonly, as long as the remote shutter release is held or locked down). Bulb mode is useful for situations when you want a shutter speed of longer than 30 seconds. Your camera will generally provide a count-up timer while you are shooting, so you know how long the shutter has been open. It is important to understand shutter speed and to choose appropriate shutter speeds for your photography situation. If you are shooting in Time Value (Tv) or Shutter Priority (S) mode, you choose the ISO and shutter speed, and your camera will select the aperture. In Manual (M) mode, you choose the ISO, shutter speed, and aperture. Even if you are shooting in Auto or Program (P), you should always keep an eye on your shutter. Make sure that it is quick enough for your to handhold (or get out that tripod) and is quick enough or slow enough to capture the effect you are looking for. 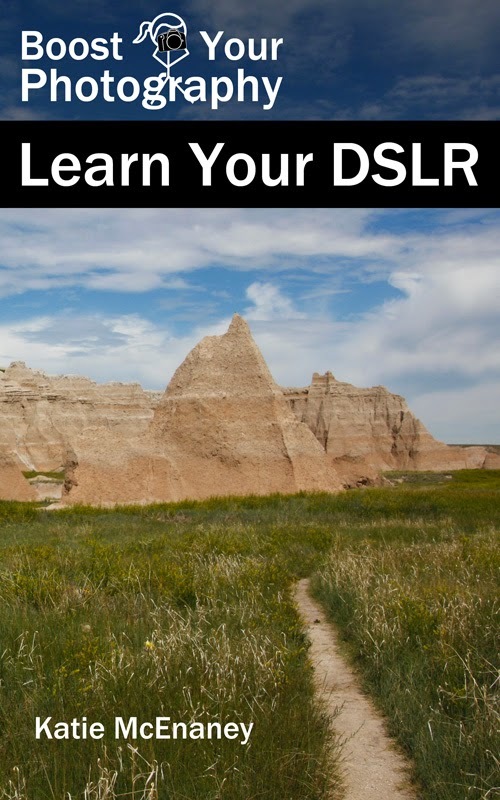 Want a full introduction to your DSLR and photography? Boost Your Photography: Learn Your DSLR is now available from Amazon. Get the most out of your camera with practical advice about the technical and creative aspects of DSLR photography that will have you taking beautiful pictures right away.